Pepper spray is a viable self-defense tool for three categories of people: Those who are prohibited from having a gun to defend themselves against violence, those who can’t countenance using a gun, and for those who have the capacity to also carry a non-lethal self-defense tool in addition to their firearm. Of course, legal restrictions apply in some areas. Unfortunately, most major disasters are followed by a dramatic increase in the number and severity of crimes of violence. With this uncomfortable reality in mind, self-defense is an important aspect of all disaster preparation. Pepper spray or tear gas can be a valuable tool to thwart a group of looters as well as an individual robber or attacker. Even if you do own a gun, consider obtaining a pepper spray device to use as a less-lethal alternative for self-defense. Modern pepper spray is made from spicy hot pepper vegetables. It is more effective than traditional CN or CS tear gas chemicals, but all three of these compounds are useful self-defense tools. While it’s true that even police-grade pepper spray is not nearly as effective as a gun for self-defense, the lethal force of a firearm is a last resort and therefore not appropriate for all self-defense situations. If due to space, weight, or other limitations it is only feasible to carry one self-defense tool, a firearm is your #1 choice. But, when it is feasible, both a gun and a police-grade pepper spray canister together, provide the range of weaponry needed in both a day-to-day and post-disaster environment. Electric stun guns, Tasers, saps, batons, clubs, knives, and other weapons, and martial arts skills, all have their value in certain circumstances. But for most people, the combination of a gun and pepper spray is the best choice for self-defense. For those who can’t have a firearm, in our opinion, pepper spray is the next best solution. For those who can legally have both, keep both tools close at hand. Having a suitable self-defense firearm plus police-grade pepper spray, is our recommendation. Unfortunately, it is impractical for us to walk around like a uniformed police officer, with a gun plus a belt-full of other tools made for encounters with violent people. Yet, for civilians, two tools can sometimes be accommodated. Therefore, if it is practical for you and your situation, carry a gun and consider keeping an aerosol container of pepper spray in your GO-Bag, purse, pocket, car, workplace, and at home. By design, pepper spray does not produce any lasting harmful effects, so it is odd that it is illegal for civilians to own in some places. Oppressive governments that do not trust their citizens are understandably reluctant to legalize pepper spray as they are afraid it will be used to oppose their tyranny. So, they make possession a crime. On the other hand, places which honestly value individual freedom, permit unbridled access to this basic self-defense tool. Fortunately, pepper spray is legal in many places. In most locales in the U.S., a license or special training is not required. In Asia, it is typically illegal. In Europe and the rest of the world, it varies greatly, even among neighboring nations. If pepper spray is legal for you to possess, get a canister for each GO-Bag, and for each trustworthy adult and older teen in your household. Then carry it. These dispensers come in various sizes, making it possible to pick one to accommodate your lifestyle. Importantly, pepper spray is simple-to-use and easy to carry. And, it is an inexpensive self-defense tool. A $20 canister of pepper spray can literally save your life or the life of a loved one. This small, handy little tool can help you avoid serious injury or violent abuse, so why not carry? The world isn’t getting safer. What is commonly referred to as “pepper spray” is a small hand-held aerosol device which dispenses a liquid, fog, or gel formulation of the chemical Oleoresin Capsicum (OC). OC is derived from a collection of spicy-hot chili pepper vegetables, thus the nickname, ‘pepper’ spray. When used against a normal, reasonably healthy assailant, Oleoresin Capsicum, aka pepper spray, is non-lethal and non-injurious. It is a chemical agent designed for use in self-defense situations where physical violence is believed to be imminent. It should not be used in lesser circumstances. When sprayed into the eyes of an attacker, pepper spray can have a debilitating effect for 15-45-minutes. Yet, it does not cause permanent injury or physical damage to a healthy adult, nor does it require medical attention to fully recover. The effect simply wears off, or the chemical can be washed off to obtain relief quicker. When used against a human attacker, pepper spray produces a burning sensation to the skin, causes uncontrollable coughing, and like tear gas, produces copious tearing and swelling of the skin around the eyes. This can limit the aggressor’s ability to see his or her intended victim, which makes it possible for the victim to escape. Also, since these effects often take the fight out of a violent attacker, the aggressor is motivated to disengage from the attack and often flees the area. On the downside, pepper spray works somewhat like an allergic reaction, so effects vary. This is true for CN and CS tear gas, as well. Unfortunately, results are inconsistent, but since it is somewhat debilitating 85% of the time, it’s still worth having. It’s certainly a lot better than being defenseless. A quality Pepper spray is more effective than any of the forms of tear gas that are available to civilians. Just as some people can better tolerate spicy foods, the reaction to pepper spray and tear gas can be very different from one person to the next. (Those who relish spicy food are not necessarily impervious to the effects of pepper spray.) However, if you do decide to carry pepper spray or tear gas, keep in mind that results can vary greatly. Some attackers will be completely debilitated temporarily, whereas others will not be affected at all. Assailants who are hopped-up on drugs, intoxicated with alcohol, or mentally ill, tend to have little or no reaction to tear gas and pepper spray. Nevertheless, pepper spray (OC) is more effective than tear gas (CN and CS), and is therefore worth having, additionally so if a firearm isn’t an option. What to look for when selecting pepper spray? 1. Select a model that shoots a stream of the OC chemical at least 10-12 feet in distance. 3. If you are considering a “budget” priced model, check the label and find one that contains 10% Oleoresin Capsicum (aka / “OC”, or “OC spray”). Not 8% or 12%, it’s 10% which is the optimal strength of OC contained in low-cost dispensers. However, if you can afford a $20 device, purchase a brand/model that is carried by police officers as these brands have a proven track record. Measurements used on police-grade devices are different, but this is a complex issue. To keep it simple, we have selected what we have found to be the best devices. As further validation, all of our ‘recommended’ brands are currently in use by hundreds of law enforcement agencies. Buyer Beware: The use of terms such as “police-grade” or similar ambiguous statements, are often simply advertising hype. Do not consider them to be a valid indicator of quality. Lists of law enforcement agencies which use the product is a much better indicator of effectiveness and reliability. Unfortunately, quality control and advertising claims are not actively monitored by any agency outside the law enforcement community. Therefore, it’s no surprise when we find that independent research has uncovered frequent discrepancies. One recent study found that the contents of these products did not match the label specifications 30% of the time. Professional-grade products such as those adopted by law enforcement agencies, use more meaningful standards than a percentage of pepper in the formula. One of the more accurate measurements of effectiveness is ‘Scoville Heat Units’ (SKU). However, this information is rarely found on product labels, except on devices which are marketed to law enforcement agencies. If you are fortunate enough to encounter this method of measurement, 150,000 SKU is considered the minimum level of potency for a quality pepper spray device. Notwithstanding, the most accurate measurement of pepper-spray effectiveness is obtained by using the ‘High-Performance Liquid Chromatography’ (HPLC) method, but this is rarely encountered. If you do find this measurement, select a product that has an HPLC Capsaicinoid rating of 0.7% or higher. A Simple Solution: Fortunately, we don’t need to undertake a lot of extra research. You can simply buy one of the products recommended below. Our “Best Pepper Spray” selections have all been evaluated and passed the rigid testing standards of multiple, major urban police departments and federal agencies. 4. The dispensing container needs to hold enough of the liquid to make it possible to deliver a minimum of seven 1-second bursts of OC spray per assailant. Minimum. Our recommendations for specific brands and models of pepper spray are included at the end of this article. The terms, “pepper spray,” “Mace” and “tear gas” / “teargas” do not mean the same thing. And further, even when dispensers look alike, what they contain and how they work may be very different. Pepper Spray. Made from a blend of spicy vegetable extracts, pepper spray was adopted by the FBI for law enforcement use in 1991. Currently, it is the best of the chemical self-defense products. Mace. 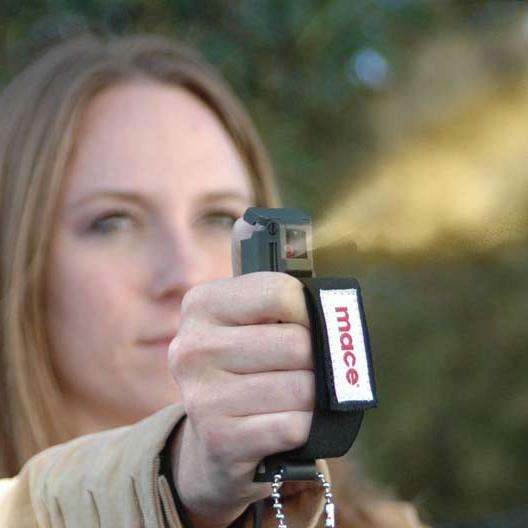 Though often misused as a generic term for tear gas, “Mace” is a company which sells various self-defense products, including tear gas, and now, pepper spray as well. Their tear gas devices became famous during the riots of the 1960s and 70s. Today, Mace makes devices for military, law enforcement, and civilian markets. The innovation of Mace was primarily the dispensing methods, not the chemical formulation used in the devices themselves. To add to the confusion, some pepper-spray dispensers also contain CN or CS tear gas. Tear gas is sometimes included in pepper spray formulations in an attempt to offset the problem that some people don’t react to pepper spray but they might react to tear gas. However, most experts argue that adding tear gas to a pepper formula is unnecessary since police-grade pepper spray (OC) is universally more effective than CN and CS. Available in various types of dispensers, ranging from devices which fit onto a key ring, those which are incorporated into a cell phone case (usually inadequate), to various shapes and sizes of small canisters, there is a multitude of sizes and formulations of pepper spray. All of these use either water or oil as a carrier for the Oleoresin Capsicum (pepper), but gel formulations which also contain dye are becoming increasingly popular. Devices which resemble a handgun are problematic if their design or coloration might confuse observers, who might think it is a firearm. Everyone’s situation is slightly different, so pick the delivery method that is best for you and your anticipated circumstances. Note: All three dispensing methods are embraced by companies which manufacture pepper spray for use by law enforcement agencies. The dispensing containers often look the same, so check the label to identify the device’s dispensing method. Stream: Typically, “stream” dispensers will propel the pepper spray further. These devices allow the user to target the assailant’s eyes with the full stream, which is why most law enforcement agencies use “stream” dispensers. Note: Regardless of the delivery method, getting the chemical directly into the assailant’s eyes is important. Cone: These devices utilize a cone-shaped spray pattern in an effort to make aiming less critical. The downside is that when the target is a single attacker, the device does not deliver the same quantity of the chemical into the eyes. Also, the user may inadvertently spray others who are next to the intended target. Another downside is that when a cone (or fogger) is used outdoors, wind can easily push the droplets back toward the user. For this reason, cone and fog devices are routinely used indoors by prison guards. Fog / Fogger: These dispensers were first developed for riot-control use where the target is multiple people, so aiming is not necessary as the goal is to blanket an entire area with pepper spray or tear gas. With this in mind, foggers are rarely used by civilians since their need is generally to stop an individual attacker or a small gang of attackers. “Fogger” devices are rarely used by police officers except for riot control when they are wearing a gas mask. Gel and Foam: These two words are used to describe essentially the same thing; a jellified or thick foam compound that is designed to stick to the assailant. The effectiveness of this delivery method is a subject of debate among experts. Whereas gel or foam dispensers can be very effective on a bare-faced assailant, anyone who is wearing glasses or a hat with a brim, may be able to avoid receiving a full dose of the chemical. Due to this potential limitation, most law enforcement agencies continue to use the “stream” dispensers for their uniformed patrol officers. Dyes: Some pepper spray and tear gas brands incorporate an environmentally-friendly nontoxic dye into their compound. This is added as a ‘marker’ to help identify an assailant who has fled the scene of the altercation. Some manufacturers use UV dye for this purpose; a compound that is only visible when exposed to ultraviolet light. Whereas others, such as FOX Labs “Mean Green” formula which uses a highly visible green dye that is readily observed by anyone who sees the “tagged’ individual. Law enforcement agencies in the U.S., Canada, and Europe, all favor pepper spray devices made by one of these three companies: Defense Technology, Sabre Red, or FOX Labs. Of these, Sabre Red boasts the largest number of U.S. police agencies from coast-to-coast, Los Angeles County Sherrif’s Department to New York Police Department. But in Canada and some European countries, and among those agencies which have undertaken extensive research, Defense Technologies if the frequent winner. In our view, all three manufacturers produce excellent pepper spray products. Therefore, we recommend that you choose from among the models made by these three, based on features: the carry size, capacity, effective range, and how you will carry the device. Defense Technology, Mark III, 360-degrees. After extensive research, this product was selected by the Los Angeles Police Department primarily because the dispenser can be operated from any position. Since it is not limited to spraying a horizontal stream, it can be operated by a user who is on the ground spraying upward, or from any other position. The above link is to the smallest “360” model made by Defense Technology, but it is the slightly larger 360 model that is used by LAPD uniformed patrol officers. Click Here for other pepper spray products by Defense Technology. FOX Labs FX-156 MGS Mean-Green can project a heavy stream 10-feet and contains a quantity of pepper spray sufficient for 9 one-second bursts. Therefore, though this device might be adequate for multiple attackers, we recommend that it be considered a device for use against a lone attacker. An additional feature is that this formula also includes a bright-green dye to aid identification of an attacker who has fled from the scene of the crime. Defense Technologies First-Defense Mark-9 is small (0.68 oz) but the dispenser is easy to hold securely and point accurately. It does not provide the same any-position operating advantage as the 360-degree models, but it can be more easily concealed in a pocket. The clip incorporated into the dispenser is to keep it readily accessible in a pocket. It should not be used to attach the device to a belt as it does not provide adequate security from inadvertent loss. Sabre Red, model KR-DL-200 is smaller in size, but this diminutive and fancy little device has ‘bling’ and yet contains the same formulation as Sabre’s basic police model. Due to the smaller size, it has a limited operating range of only 10-feet, but it is still capable of delivering 25 short bursts of pepper-spray stream. Sabre Red 3-in-1, model HC-14-BK-US is small but has an ergonomic design, making it easy to handle. It contains the same 3-in-1 formula police-grade pepper spray, plus CS tear gas, and UV marking dye. It only has a 10-foot operating range, but it is capable of 25 short bursts. Sabre Red model PEN-14-OC, looks like an ordinary pen for taking notes so it can be kept in plain sight, where it’s ready for immediate use. It has a 15-foot range and a stream-style spray, but it only contains enough pepper spray for 15-bursts. It’s small size and covert appearance make it a unique delivery device for police-grade pepper spray. Defense Technologies Mark-IV Pepper Spray + CS Tear Gas, model 56045 Grey Band (3 oz), AND, Sabre 3-in-1 Magnum (4.36 oz) Pepper Spray + CS Tear Gas + Marking Dye. These two products are the pepper spray devices used by most law enforcement agencies, worldwide. They not only contain high-strength pepper spray, but also military-grade CS tear gas. Therefore, either of these devices is a formidable self-defense tool to keep at work, home, in a vehicle, on in a GO-Bag. Both of these devices are suitable for defense against multiple attackers, or for use in multiple incidents. Though these tools do not provide the universal, decisive defense of a self-defense firearm, we regard them to be the most effective option in the non-lethal category. These are the canisters carried by uniformed law enforcement officers in Canada, Europe, and most U.S. cities. Unfortunately, neither utilize the new 360-degree “bag” technology of our top-choice, but they do hold a larger quantity of pepper spray than does our top-choice. So, though these are not the newest technology, they are both time-tested, and they both contain proven formulas and reliable dispensers. Both are still being ordered by local, State, and federal agencies. 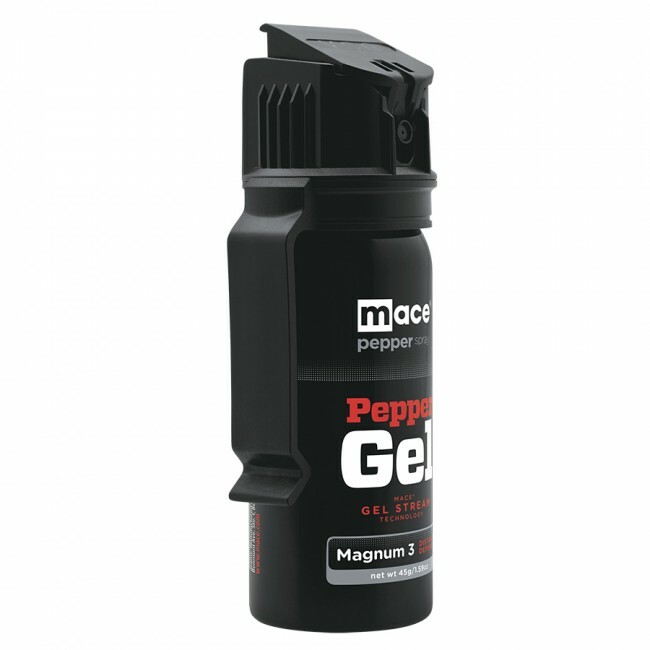 Best Pepper Spray Device – For Use Against Looters, Gangs, and Groups of Destructive Anarchists. Defense Technologies Mark-IX Stream produces a strong spray that reaches 18-20 feet. Armed with this device, the user can maintain a greater distance between themselves and a violent crowd of thugs. This is is our product of choice for those who might need to protect a retail business from looters or a family home from multiple attackers. A pepper spray canister should be replaced if it there is an odor emanating from the container when it has not been recently used. 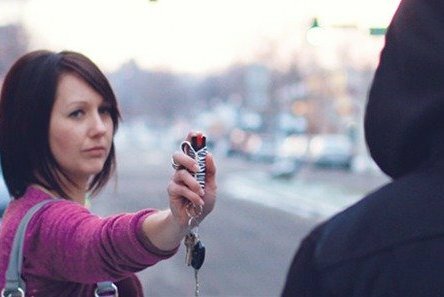 If you don’t know what pepper spray smells like, in a safe place, discharge a 1/2-second burst so that you can experience the odor and a little of the effect. Reliable brands of pepper spray will have the manufacturing date printed on the product’s label. If it doesn’t also include a recommended replacement date, we recommend replacing it within four years of the manufacturing date. However, this does not mean that the old canister must be discarded. Instead, make it a backup device. The active agent in pepper spray will remain effective for many years. The problem is leaks which may render the device inoperable, diminish its effective range, or make it a nuisance due to a leak. Store your pepper spray devices in a safe place. If you elect to discard an old device, follow the manufacturer’s recommendation for disposal. As in all dangerous or potentially violent circumstances, having a weapon, whether it be a gun or pepper spray, should not motivate us to take unnecessary risks. Notwithstanding, we fervently urge responsible level-headed people to take the steps necessary to be able to defend themselves. This includes having a weapon for self-defense. Further, we strongly advocate for being prepared and trained in the use of that weapon, but we also encourage discernment and having the smarts to flee from unnecessary altercations. Yet, in the real world, responsible citizenship sometimes requires us to take a stand against those who abuse and harm others. It is sometimes necessary to resort to aggressive action to defend ourselves and others. To do less is to invite oppression and anarchy. Click Here for information on firearm defense and gun selection. Click Here for additional information on pepper spray, including how to use pepper spray, medical treatment after exposure to pepper spray, and legal considerations. Lastly, even if you have a gun for self-defense, we encourage every responsible adult who can legally own pepper spray, to obtain at least one of the best-choice pepper spray devices listed above. Posted in Defense: Firearms, Self-Defense, Family & Community Safety, Emergency "GO-Bags" & Gear (Evacuation Knapsacks), Safety.